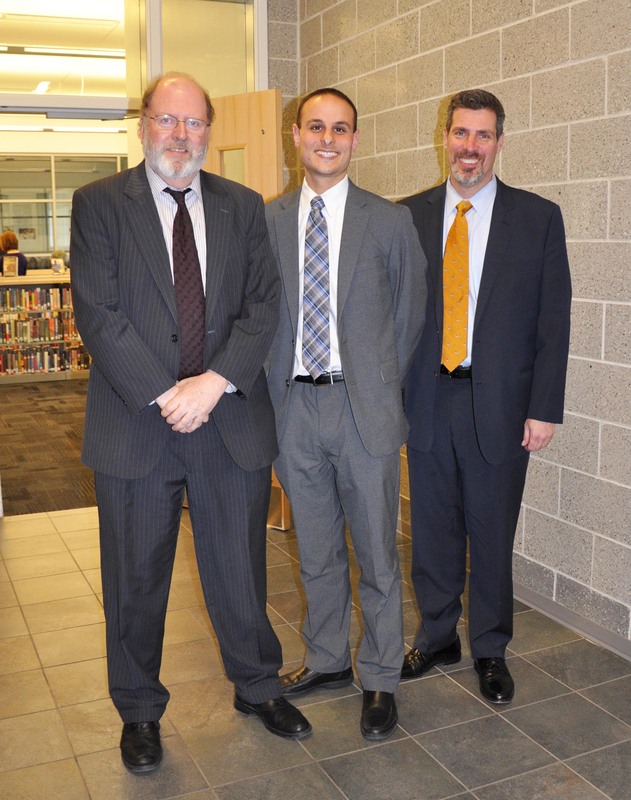 John Harrison, center, with John Retchless, superintendent of schools, left and Alan Cron, principal of RHS. By now, everyone knows that with the retirement of Superintendent John Retchless, Dr. Cron is going to move from principal of RHS to the superintendent’s position. That, of course, causes RHS students to wonder who the next principal will be. Well, that question has been answered. The selection process for the new principal started with thirty-eight applications, which were then cut down to four finalists, made up of two internal candidates and two external candidates. A committee of “one school committee member, two parents, four teachers, and four administrators,” conducted interviews with each finalist, according to Mr. Retchless. After a month of extensive interviews, John Harrison, who is currently the assistant principal at Dighton-Rehoboth Regional High School, was chosen as the next principal of Rockland High School. In an interview last week, Mr. Harrison answered some questions about himself, his experience, and his feelings about his selection as the new principal. First, Mr. Harrison said he enjoys running, playing tennis, and is currently working on his doctorate at Northeastern University. He is also a big Boston sports fan. Before becoming assistant principal at DRRHS four years ago, he was a math teacher for five years at Reading Memorial High School. “In my time as a teacher, I also was a class adviser, took students on service learning trips to Honduras and Virginia, and coached tennis,” said Mr. Harrison. First impressions are everything and Mr. Harrison hopes to make a strong one within the RHS community. “One thing students should know about me is that I will be very devoted and passionate about my job as principal. I will be highly visible within the building during the school day and students will see me at the extracurricular events which are so important to building a strong school community,” said Mr. Harrison. Dr. Cron has been well known for his approachability and connection with the students. Mr. Harrison hopes to continue that open-door policy here at RHS. “Yes, I will have an open-door policy. Getting to know students is one of the best parts of the job of principal. I want students to feel that I am approachable, and I look forward to working with the staff to support all students,” said Mr. Harrison. While Mr. Harrison has not met the student body yet, Michael Ahern, senior class president, shared some advice with the Veritas for the soon-to-be new principal. For his part, Mr. Harrison already has a positive feeling about the school and the town of Rockland. Mr. Harrison also said that he is very impressed by the staff, students, and community members. Go here for a video of Adiza Alasa’s interview with Mr. Harrison.